Optional Floor Stand for SC25 series A1 ScannerThe floor stand comes with a handy document catch bas.. The SmartLF SC 25 Xpress has an optional Document Return Guide that allows users to have scanned doc.. The new SingleSensor (patent pending) digital imaging technology for SmartLF SC 25 large format scanners is a Colortrac invention. It combines Contact Imaging Sensors (CIS) in a robust design that is aligned in a single array for life. This gives a higher optical quality and improved match between sensors. Coupled with a short image path that reduces optical errors and a full-width scan, it has 30,000 pixels at an optical resolution of 1200dpi helping to record accurate colour fidelity and immaculate digital image rendition. Image lighting whilst scanning is with a bi-directional white LED lighting system, it optimises the object illumination whilst giving an “Instant-on” scan response. This lowers power consumption and eliminates the effects of shaded areas caused by document creases seen in some scanners. Uses a new design incorporating a larger and easier staging platform to load your documents “Face-up” up into the scanner. With a maximum media width of 25” (635 mm) and with Right or Centre justified document loading, it uses the proven straight-through media path for flexible media in the form of technical documents and maps up to 0.08″ (2 mm) thick. This is more than enough to meet most AEC, CAD, GIS and Copyshop or service bureau scanning requirements. SmartLF SC 25 large format scanner uses a new document feed design incorporating a full width document transport roller giving it the ability to dynamically respond to small changes in document thickness such as creases. It also maintains an even feed tension across the full width of the document. This even pressure ensures delicate or fragile media such as Newspaper or old Blueprints may be safely scanned keeping the media firmly against the imaging SingleSensor across the document width. This increases the image accuracy and reduces the impact of any shadows caused by wrinkles in the document. SingleSensor is a full width straight-line contact image sensor of 30,000 pixels; a Colortrac invention - patent pending. for a SmartWorks Pro image is limited by the file format specified, the available disk space and the computer operating system. preview and all Windows driven printers supported. TWAIN	A Twain driver is included which provides basic control over scanner color mode, resolution and paper size setting. A compatible application is required – see Colortrac .com for details. Free Delivery to Ground Floor. 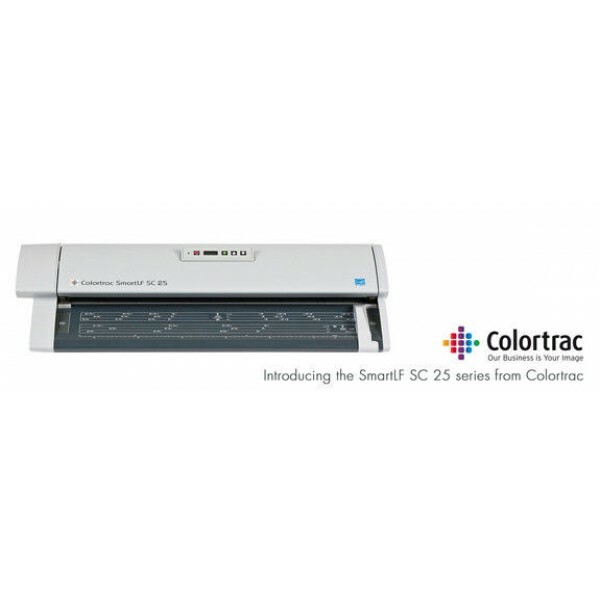 Colortrac SmartLF SC 25 Mono Scanner - Ideal for scanning Maps, Plans, Technical documents, Blueprints and Architectural Drawings. 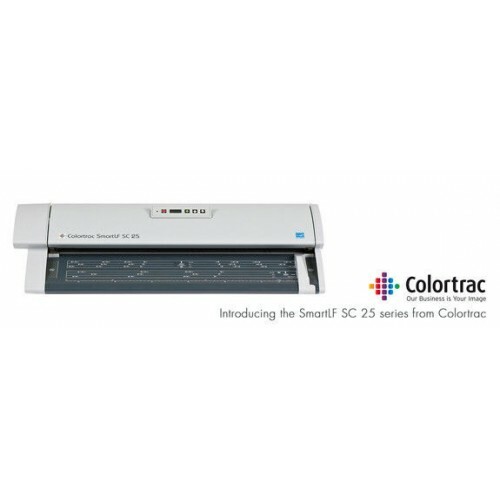 The new compact SmartLF SC 25 Xpress large format scanner is the best general purpose solution for scanning wide format Technical Imaging and Color Graphics documents up to Arch D, ANSI D, ISO A1 or B2. With a small footprint, it is ideal for Small Office, Home Office, On-site Building Services, Architectural, Engineering, Construction, Facilities Management or Electronic Document Capture (EDC). Using the optional Document Return Guide, it allows you to feed and retrieve documents from the front, making the reduced footprint of the solution ideal for small offices. High speed scans in monochrome.